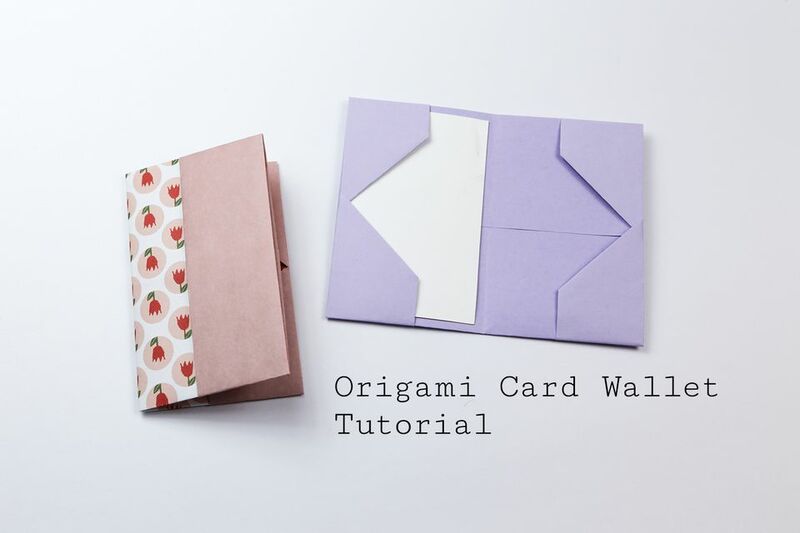 Learn how to make a simple origami wallet to keep business cards or credit cards in! This is an easy to follow step by step tutorial. This useful origami wallet has a total of 4 pockets to store cards! There is a pocket on the front and on the back and inside there are two pockets on either side. You'll need one sheet of square paper, in order to fit most business and credit card sizes, use paper that is at least 20 x 20 cm (8.8 inches). You won't need any glue for this but you certainly can use some at the end to make the wallet more secure and sturdy. For another useful origami model, check out the Easy Origami Card Stand Tutorial - you can display cards in this! 1. Start by folding the paper in half, left to right. 3. Flip the paper over to the other side, left to right. 4. Fold the right edge in to the left, if you are using business cards, use one as a guide, leaving a gap on either side. Same for credit cards. 5. Flip the paper over to the other side. Fold the left edge in to the right, using the flap underneath it as a guide. 6. Open out the back layer to the right. 7. Open the left and right flaps. 8. Fold the right and left edges inwards a little bit, this will help to stop the paper from ripping if you use the front pockets. 9. Fold all four corners diagonally aligning with the two vertical creases. 10. Re-fold the left and right sections. 11. This is what you should have. 12. Flip the paper over, left to right. 13. You can fold the bottom up to the top to make a very small pinch mark on the left side. 14. Fold the bottom edge up, a little bit past the pinch mark, about 2mm. 15. Fold the top edge down, a little bit further than the pinch mark again. 16. Slot the top into the bottom and fold the paper in half, left to right. I run a youtube channel called Paper Kawaii, if you like origami, I think you'd like it so click here to have a look. Check out my blog too if you like these tutorials.